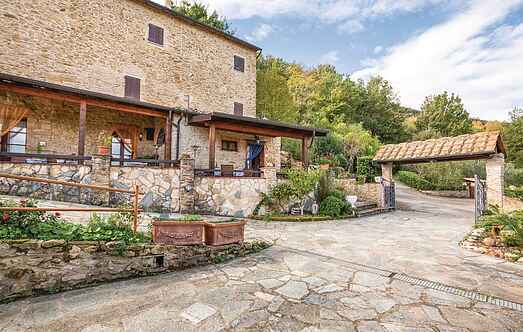 Find a vacation home to rent in Volterra from our list of vacation rental properties. Campaya has over 32 vacation homes available in Volterra, which give you the possibility to locate a unique accommodation in Volterra which completes your check-list in search for the perfect self catering vacation apartments in Volterra or vacation villas in Volterra. Small independent house situated in a panoramic position, surrounded by vineyards, olive grove and chestnut woods. The area has many ruins from the Etruscan period and it is only 40 km from the sea. Pretty two family-house adjacent to a watchtower, dating back to the medieval wars between Volterra and San Gimignano, probably used as customhouse once. This renovated country house has been transformed into a country cottage. This holiday home is renovated and has 5 apartments in a farmhouse near Volterra, one of the most beautiful towns of Tuscany.